PATTERSON, PETER, businessman, justice of the peace, and seigneur; b. 11 May 1768 in Bagdale (Whitby), England, son of Peter Patterson, labourer, and Mary — ; d. 12 June 1851 in his residence at Chute Montmorency, near Quebec. Having grown up in or around Whitby on the Yorkshire coast, Peter Patterson conceivably found employment and acquired experience in the Baltic wood trade conducted at that port. In 1801 he arrived at Quebec, probably in the company of Henry Usborne*, a British merchant established in the Baltic trade, who came to initiate the timber business on a large scale between the St Lawrence River and Great Britain. 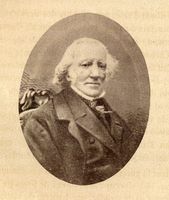 By 1805 Patterson was employed in Usborne’s Quebec branch. Patterson is said to have had some experience in shipbuilding, and as part of his duties in 1805 he surveyed the construction of a ship at Quebec for Usborne. During its early years the Usborne firm carried on a business in masts, spars, bowsprits, pine and oak square timber, planks, and staves from the St Lawrence River and Lake Champlain areas. When Usborne returned to England in 1809 to direct the London end of affairs, Patterson took over the Quebec firm. Usborne remained in the Quebec partnership, and, with the addition of James Dyke of Quebec and Richard Collins of Montreal, the business was conducted at Wolfe’s Cove (Anse au Foulon), at first under the name of Patterson, Dyke and Company, and by 1815 as Peter Patterson and Company. The firm served as agent and factor for the London partnership, managing the purchase, assemblage, and loading of cargoes. For British North America and the port of Quebec these were years of rapid expansion in the timber trade to the mother country. A disruption in Baltic supplies, which Usborne had anticipated when he established the Quebec branch, came with the brief success of Napoleon’s continental blockade in 1808–9; Baltic pine imports by Britain had plummeted from 213,637 loads in 1807 to 26,764 in 1808. The North American colonies picked up some of the slack in the supply of this commodity, crucial to the Royal Navy’s war effort. In 1807–8 their exports more than doubled to 60,467 loads, and subsequent adjustments in British tariff policy, designed to encourage the colonial supply further, pushed exports to 171,796 loads by 1812. Following a disruption of transatlantic traffic during the War of 1812, colonial exports again increased, reaching 267,065 loads of pine alone by 1819. A trade virtually non-existent at the beginning of the century had taken root at Quebec and Saint John, N.B., as well as in the Miramichi region, and had grown to become the commercial mainstay of the colonial economy. Although at the outset the St Lawrence region was a secondary source of timber after New Brunswick, the growth of the trade conducted through the port of Quebec was rapid. In 1820 Usborne affirmed that since 1801 the number of ships engaged in the timber trade from Lower Canada had climbed from 80 to 800. The principal exports at the time were pine and oak square timber, pine and spruce deals (planks 12 feet in length, over 12 inches wide, and usually 3 inches thick), and staves, together with masts, spars, and other naval timbers. Patterson and Usborne initially dealt in square timber, but they quickly turned to deals. In 1811 they acquired property around the Chute Montmorency, and by 1818 Peter Patterson and Company had completed construction there of one of the largest sawmill operations for the time in North America. To supply the mills, it purchased timber along the St Lawrence and in the Lake Champlain area, but apparently conducted some lumbering on its own in the Saint-Maurice valley as early as 1819. The firm also acquired undeveloped land about the province, presumably for timber. Patterson’s association with Usborne served him well. Not only did he become firmly established in the timber trade at Quebec, but he developed interests in shipbuilding, and efforts to rationalize round-trip charters drew him into the import trade and passenger service. In Quebec’s commercial community, he became a well-known and respected figure. From 1813, with John Mure* and James Henderson, he served as attorney for a London firm of timber merchants, Linthorne and Jolliffe, and from 1815 he acted in the same capacity during the liquidation of the firm’s holdings. In May 1819 he was nominated to the newly formed board of cullers along with William Bacheler Coltman* and five others. The board was established by the Lower Canadian House of Assembly to ensure the quality and fair measurement of timber and wood products at Quebec, and to examine and license cullers, who carried out measurements. Patterson appears also to have served briefly as justice of the peace from 1821. In 1823 the partnership between Usborne and Patterson was dissolved. 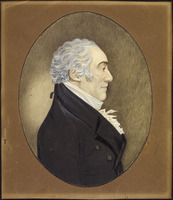 Patterson took over the firm’s office at Quebec as well as the remainder of a nine-year lease on the “Domaine of Sillery” obtained from the colonial government in 1820 by George William Usborne, a relative of Henry. The property included a sizeable stretch of beach to the west of Quebec, of particular value for the reception, measuring, and loading of timber for export. From 1823 Patterson sublet coves along this beach to other merchants, among them George Longley* and John Richardson*. Patterson continued his specialization, developed during his partnership with Usborne, in the production and sale, either at Quebec or in Great Britain, of deals and boards. Among his accounts at Quebec were shipbuilders, timber merchants, and a cabinet-maker. The centre of Patterson’s business activity and his principal residence, even while he was in partnership with Usborne, were at Montmorency, where he operated the sawmills at the foot of the falls and occupied Haldimand House, the former residence of Governor Sir Frederick Haldimand*, above them. Equipped with a blackmith’s and a carpenter’s shop, carts, scows, fire-engines, booms, and other equipment, the installation, together with the residence and land along the Rivière Montmorency upstream from the falls, would be valued at about £46,000 in 1852. 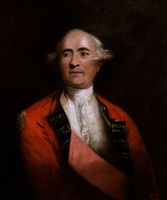 Montmorency was not, however, the only site which Patterson exploited. Without reducing his operations there, in February 1842 he began leasing from the Dénéchaud family a sawmill on the Rivière Bécancour formerly operated by Claude Dénéchaud*. The lease was for five years at an annual rent of £120. From at least the early 1830s a large proportion of the saw logs for Patterson’s operations had been coming from the area drained by the Bécancour; in renting the Dénéchaud mills, he felt he would benefit from manufacturing deals and boards closer to the source of the raw material, on a site where water power for the operation of a mill was readily available. The agreement was cancelled in November 1846 at the request of the Dénéchaud family. Three years later Patterson purchased from George William Usborne for £500 the lease (running until October 1852) on government-owned mills at the mouth of the Rivière Etchemin near Quebec. Built by Henry Caldwell* early in the century and later exploited by his son Sir John*, the Etchemin Mills were, with those operated by Patterson at Montmorency, among the largest in the colony and cost £585 a year in rent. Patterson obtained the timber for his sawmills through various arrangements, including the acquisition of crown timber limits, the subleasing of limits held by others, the purchase of cutting rights on privately owned tracts, and the buying of extensive wooded lands. The acquisitions of land were probably also made as investments in their own right for speculative purposes. 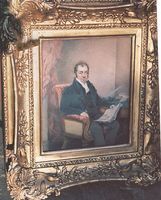 He made large purchases in Nelson, Somerset, and Stanfold townships during the 1830s, and in 1838 he was listed by Charles Buller*, secretary to Lord Durham [Lambton*], as one of the province’s 105 principal owners of non-seigneurial lands; his holdings at that time totalled some 22,000 acres. During the 1830s and 1840s he acquired nearly 40,000 acres for his timber operations in the Eastern Townships and Bois-Francs and in Caxton and Somerset townships. 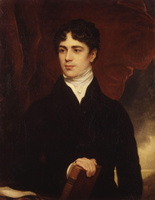 He also greatly increased his holdings around Montmorency; on 27 May 1844 he purchased the seigneury of Beauport at auction for £8,300, and by 1851, through direct purchases, exchanges of property, and sheriff’s sales, he also had acquired virtually all of the land along both banks of the Rivière Montmorency for a distance of about three miles upstream from the falls. Most of Patterson’s saw logs came from the Bois-Francs and Eastern Townships, particularly from shanties in Blandford, Bulstrode, Ireland, Maddington, Somerset, Stanfold, and Wolfestown townships, but he also contracted for logs from the Rivière de l’Achigan above L’Assomption, and by 1851 he was investing considerable capital in saw log production on the Ottawa River. That year he contracted with Ruggles Wright Jr and Joshua R. Wright for them to get out the timber on limits along the Rivière Gatineau, and he advanced them £4,679 on their production for 1852, slightly more than half the capital he advanced to all contractors for that year. Patterson’s arrangement with the Wrights was typical of his and his competitors’ business relationships with their suppliers. After having acquired a timber site or cutting rights, he contracted with a lumberer, usually a farmer residing near the site, to cut the desired quantity and category of timber. In this manner most of his raw material was ensured by contract in the fall for delivery at his mills the following summer. Throughout the winter Patterson provided specified periodical advances amounting to about two-thirds of the value of the contract, the balance to be settled after the last delivery. As a guarantee for the advances the terms of the contract gave Patterson ownership of the logs as soon as they arrived at the river nearest the site, but saddled the contractor with all risks encountered in the transport and classification of the timber until the logs arrived at the mills. In addition Patterson assumed costs involved in hauling and rafting, as well as boom and culling fees and other expenses for which the contractor was at least in part responsible. On occasion, at the closing of accounts, the producer found himself indebted to Patterson and obliged to mortgage his properties to him, be they residences or timber tracts. Patterson sometimes would purchase logs on hand. In July 1837, for instance, he bought for £750 “all the saw logs on the Ottawa River near Hawkesbury [Ont.] that may have gone adrift” from the booms at the mills operated by George Hamilton* and Charles Adamson Low. In the agreement of sale it was estimated that there were 18,000 logs strewn along the banks of the Ottawa, and, despite the cost involved in reclaiming and transporting them to Quebec, Patterson paid considerably less for this timber than if he had contracted to have it cut. The real estate transactions completed by Patterson in 1843 and 1844 and his ability to make substantial advances to his suppliers indicate the measure of his success and a significant accumulation of capital. As a rule Patterson did not invest in private loans or mortgages, a form of investment generally favoured by the commercial class of the colony, but he appears to have made exceptions for close business acquaintances in need. In 1846 he lent £1,400 to William Price*, a Quebec timber merchant in financial difficulty. Patterson took a mortgage on the greater part of Price’s ship the Liverpool. A much greater sum was advanced to Patterson’s close friend George Pemberton, a well-established timber merchant at Quebec and a partner in the firm of Pemberton Brothers. In 1847 Pemberton Brothers were caught, as were other important Quebec commercial houses, by the excessively poor market for wood in Britain and were obliged to take a loan of £5,000 from Patterson on the Quebec-built ship the Maple Leaf. Despite business relations and a friendship with the Pembertons going back at least to the 1820s, Patterson became so alarmed by the firm’s weakness that in December 1847 he gave power of attorney to Rankin, Gilmour and Company of Liverpool, England, to dispose of the vessel. Successful in the timber trade and secure in his land investments, Patterson did not diversify his business activity much beyond these interests. Only towards the end of his life did he venture into other enterprises. 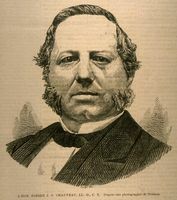 With a group of investors that included Henry LeMesurier*, Patterson formed the Quebec and Lake Superior Mining Association in October 1846. He served as founding president of the company, and in 1848 held 6,100 of the 44,000 shares. 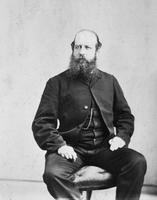 He would also appear to have been the guiding spirit behind the formation of the Quebec and Richmond Railroad Company, sometimes called the Quebec and Melbourne Railway, in 1850. As its president, Patterson was joined on the board of directors by an impressive group of Quebec capitalists and political figures, including Louis-Joseph Massue*, Pierre-Joseph-Olivier Chauveau*, James Bell Forsyth*, and LeMesurier. To link Quebec with the St Lawrence and Atlantic Rail-road near Richmond, on the Rivière Saint-François, the railway was to pass through the townships in which Patterson held much of his property. However, construction did not get under way until January 1852, seven months after his death. As well, Patterson was a member of the Quebec Provident and Savings Bank in 1847. 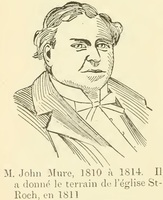 Interested in the affairs of the Church of England at Quebec, he was among a group of influential citizens who in 1843 had sought incorporation of the Church Society for the diocese of Quebec, an association formed, in part, to provide financial support for clergy and their families in the diocese. Patterson seems never to have married, but he had a daughter, Mary Jane, who became the wife of George Benson Hall* in 1843. He took his son-in-law into the business at Montmorency, and they shared other business interests, such as the Quebec and Lake Superior Mining Association. The two appear to have had a disagreement, however, and in May 1851 Patterson excluded Hall from the firm. He granted Hall an annuity of £100 for the support of Mary Jane and the children on condition that Hall move to Upper Canada. These instructions were not acted upon before Patterson’s death one month later, and Hall remained at Quebec where he took over the family business. Patterson’s will, however, gave virtually all his property and wealth to his daughter, and after her death to her children. Although Hall operated the business, and the installation at Montmorency came to be called the Hall Mills, they were in fact owned by his wife. ANQ-Q, 30076; CE1-61, 16 juin 1851; CN1-49, 25 juin 1814–7 mai 1852; CN1-67, 9 mai 1848–16 avril 1849; CN1-230, 15 août 1817; E21/35; T11-1, 4290, 4311, 4313, 4315. Arch. judiciaires, Québec, Testament olographe de Peter Patterson, 17 juin 1851 (see P.-G. Roy, Inv. testaments, 3: 110). Mount Hermon Cemetery (Sillery, Que. ), Reg. of internments, F52, lot 144. North Yorkshire Record Office (Northallerton, Eng. ), Whitby, Reg. of baptisms, 6 June 1768. PAC, RG 4, A1, 220, 5 May 1823; RG 68, General index, 1651–1841: 66; 1841–67: 353. L.C., Statutes, 1843, c.68; 1847, c.69; 1850, c.116. Morning Chronicle (Quebec), 27 May 1847: 13, 16, 18 June 1851. Quebec Gazette, 30 April 1812; 13, 20 May, 16 July 1813; 28 Sept., 5 Oct. 1815; 15 May, 18 Sept. 1817; 12 March, 21 Sept. 1818; 22 April 1819; 5, 30 July, 26 Nov. 1821; 12 May, 7 July 1823. Quebec Mercury, 13 June 1851. [J.-C. Langelier], Liste des terrains concédés par la couronne dans la province de Québec de 1763 au 31 décembre 1890 (Québec, 1891), 14–16, 64, 82, 603, 609–11. Quebec directory, 1822, 1826, 1844–45, 1847–48, 1848–49, 1850. John Keyes, “La famille Dunn et le commerce du bois à Québec, 1850–1914” (thèse de phd en cours, univ. Laval, Québec). D. T. Ruddel, “Quebec City, 1765–1831: the evolution of a colonial town” (d. ès l. thesis, univ. Laval, 1981). G. R. Stevens, Canadian National Railways (2v., Toronto and Vancouver, 1960–62), 1. The storied province of Quebec; past and present, ed. William Wood et al. (5v., Toronto, 1931–32), 4. John Keyes, “PATTERSON, PETER,” in Dictionary of Canadian Biography, vol. 8, University of Toronto/Université Laval, 2003–, accessed April 20, 2019, http://www.biographi.ca/en/bio/patterson_peter_8E.html.